We have providing distributorship opportunities in India, you own boss business opportunities, your own business opportunities with low investment. distributorship business is fast set in market, grow high, you boss in this business and we have provide you to brand name. discount brand factory is largest organizational Laxyo group of company in India. 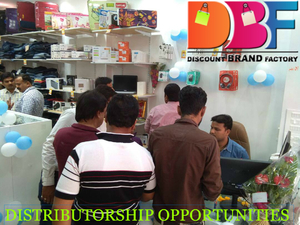 Start your own business by becoming an distributorship opportunities in India of discount brand factory leading of franchise business. our franchisee opportunities helps entrepreneur to our distributorship opportunity. we have provide your own business opportunity with low investment and you own boss in this business, so you can open a distributorship franchise opportunity.